Thursday afternoon our county was under a tornado warning for a while, and while the worst of the weather missed us, there was still enough thunder and lightning to wreak havoc with our outdoor class schedule. The storms did bring two positives, though: after the front had passed through we were treated to a cool, perfect morning Friday (some of my coworkers who are Georgia natives complained about the chill, but I was loving it)… and this cool little critter showed up on the dormitory’s front wall (the same wall that produced this, and this, and even this). Okay, okay, I have no proof that its arrival was in any way connected to the weather. 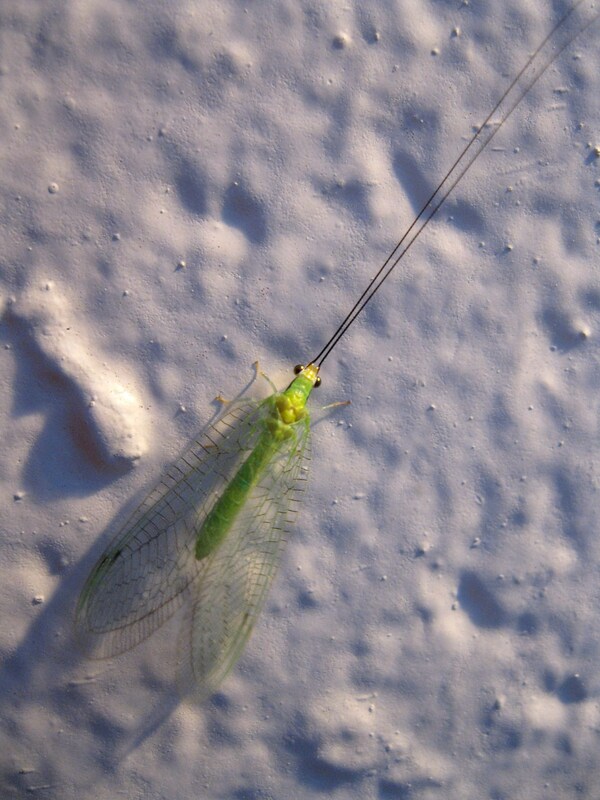 But I had never seen a lacewing before – yes, really! – and its sudden appearance right as the rainstorm was hitting seemed significant. 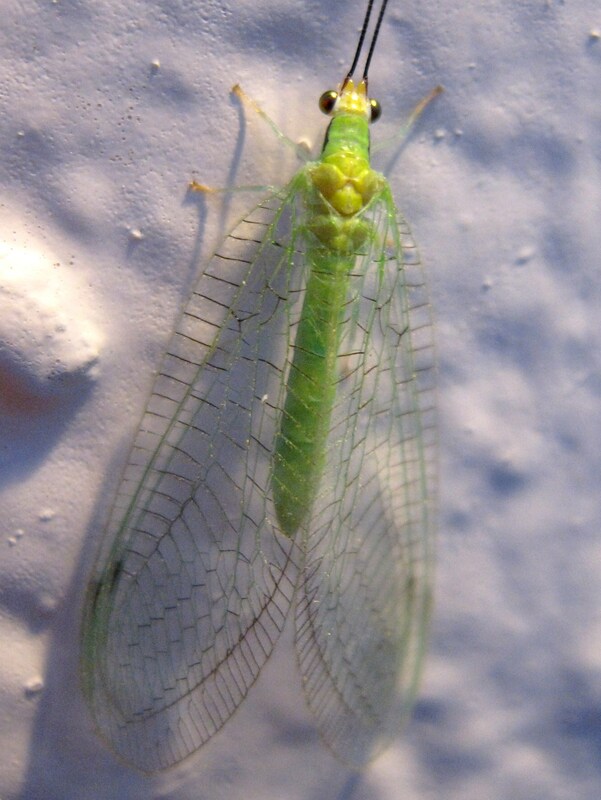 When I looked it up online I realized that there are many almost-identical green lacewings, so as far as identification goes I’ll have to settle for Chrysopidae sp. As larvae, these guys are voracious predators of other insects including aphids, so they’re sometimes used in biological pest control. You can see how they get they get their name! Wow, I just blew one off my arm not an hour ago while working in the garden. I had no idea they were pest eaters. Glad I blew it off instead of flicking it! Stunning photographs. Did you shoot these with an digital SLR? A beautiful example of the intricacy of nature. Such fine construction! No, just a point-and-shoot, a 12.1-megapixel Canon PowerShot that luckily for me has a great macro setting. I’d love to learn to use an SLR eventually, though. 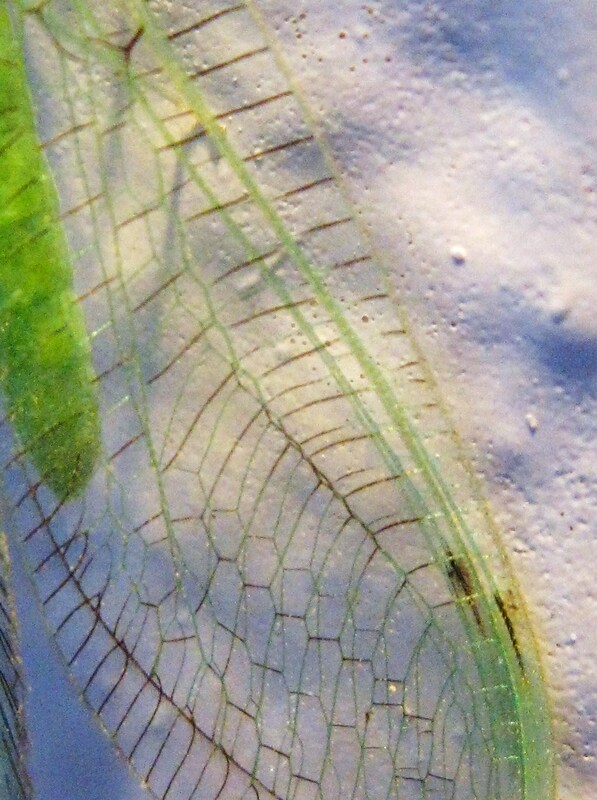 I just adore lacewings; they’re so elegant and gracious – almost fairy-like. In Danish (I’m from Denmark) we call them goldeyes (guldøje). Next Next post: Katy Is, Katy Does, Katydid!